Thailand has some of the most beautiful food in the world. Celebrated for its incredible fresh flavours and the most amazing ingredients to play with, it’s a cook’s dream. I was lucky enough to visit in 2008 and had the best time eating and getting very sun-burnt! I had been reliably informed that J. K. Rowling really rated a Thai restaurant in Belgravia called Mango Tree. So, of course, my hopes were high. Surely she couldn’t be wrong?! Aggressively hungry, I headed in prepared to pig . The restaurant is open and contemporary and hosted a mix of dates, families and larger groups. Greeted with a wealth of dish choices and on the edge of “hanger”, the waitress kindly recommended a few items and I was ready to roll! First-up came a little amuse bouche of apple and strawberry salad with a zingy fresh dressing, punchy with salt to work against the sweetness of the fruit. A lovely little opener. Then the first of the starters arrived; the Dim Sum Platter. 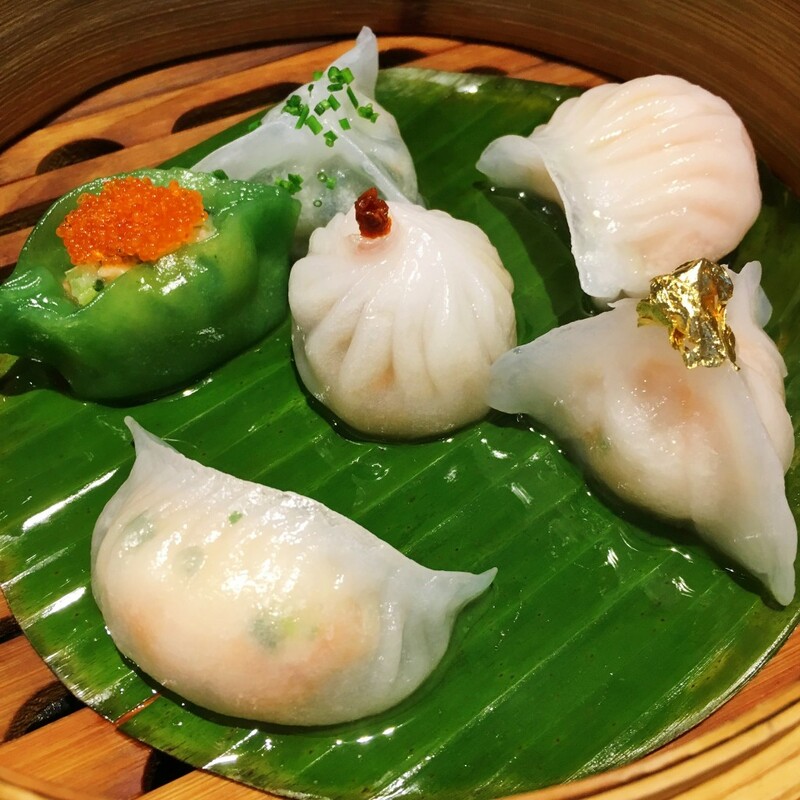 It included a prawn dumpling with white truffle oil, lobster and coriander dumpling and a Chilean sea bass gold leaf dumpling. Not only did these look stunning in their steaming bamboo basket but they were beautifully tasty; simplicity at its finest. Alongside this came tempura soft-shell crab with a mango salad and citrus soy sauce. Again, by relying on the quality of its ingredients and cooked simply, it was another sure winner. Crisp-coated buttery crab with fresh mango salad to cut through, my taste buds were tantalisingly set up for the dishes yet to come. The first to arrive was the Weeping Tiger, which has to be the coolest name for a dish. Grilled Wagyu steak marinated in Thai dressing and served with a beautiful som tum salad (papaya, green bean, tomato with a tamarind, chilli and fish sauce dressing). The first forkful of steak induced an eye rolling moment as it really did almost melt in the mouth. The high quality Wagyu steak and its delicious fat content meant there was an incredible buttery texture. 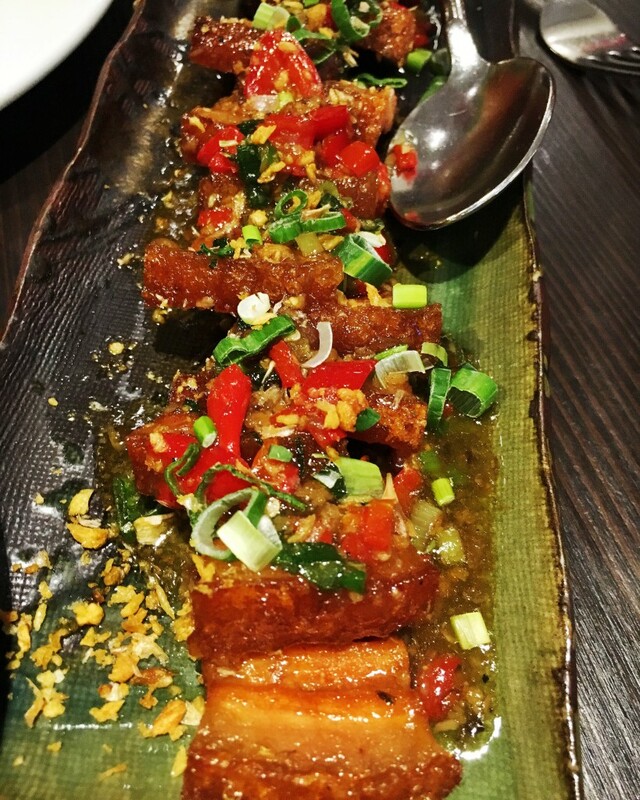 With this came Moo Nam Pueng; crispy deep-fried pork belly tossed with spring onion, garlic and chilli. My lord, this was good! Crisp, rich and absolutely packed with all the flavours you could possibly want, with a sauce that is just made for mopping up with coconut rice. I’m really not ashamed to say that I love retro food. Chicken Kiev, quiche, prawn cocktail, what’s not to like! Coin Laundry offers all of this nostalgia, plus plenty more. I wandered down to this relaxed restaurant, situated in gorgeous Exmouth Market, with hopes that I’d be magically transported back to my childhood with the first bite from this retro menu. There was so much that appealed that in the end I went slightly rogue and decided to let the waitress choose for me. 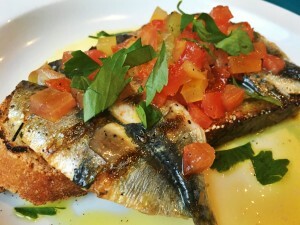 A little while later, whilst sipping on a dangerously easy-to-drink cocktail, the first course came; grilled sardines & tomatoes on toast. Refreshingly simple and just what I needed on a hot day; it ticked all the boxes. Beautifully balanced with rich, fresh sardines and plump tomatoes covered in a zingy dressing on crunchy sourdough. Bravo. Next up was a dish of lamb chops, braised leeks and cottage cheese. Probably not one I’d have picked because I was a little concerned about that pesky cottage cheese. On a Ryvita with Marmite..fine…in this… not so sure. However, I was proven wrong as it performed almost like a raita and worked really well, providing a freshness, alongside the perfectly-cooked chops and buttery braised leeks. The Coin Laundry seems to be doing a good job at rescuing these forgotten and wrongfully slandered and neglected retro dishes. It’s also a super-relaxed environment, great for dates and families alike. With an average of £7 for a starter and £13 for a main it gives pretty great value for money, especially considering the location. They also have plenty of board games which is obviously a plus if you fancy a game of Guess Who over a coffee, learn more about gaming here if you are interested (and who wouldn’t)!